Car-shopping website Edmunds.com announced this week that it has acquired CarCode, an app maker based in Seattle and Ann Arbor, MI. The terms of the deal were not disclosed. “It’s a great company to be joining,” says Nick Gorton, CarCode’s co-founder. CarCode SMS gives dealerships a local number to use for texting. When texts come in, they are read by the CarCode software and assigned to salespeople, who can then respond through the app while the customer is sending and receiving texts normally. The calls can be assigned to specific salespeople in order, or round-robin style. CarCode software also detects key words and integrates them into the dealership’s customer relationship management system. CarCode originally developed the app as part of a hackathon sponsored by Edmunds earlier this year. The three-year-old CarCode already had developed an app that helped salespeople working at dealerships retrieve information on the spot about the cars they were selling. 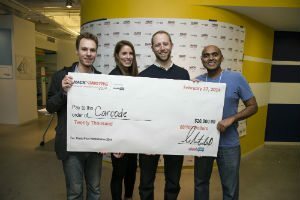 CarCode ended up winning the hackathon, which led to a dramatic increase in dealerships reaching out to the company to express interest in its products.